Mid-September was a heady time for Carly Fiorina: she did pretty great in the second GOP debate, and subsequently saw a huge surge in the polls. That’s all gone now, probably because she lied and lied and lied some more about Planned Parenthood, and everybody noticed. Fiorina handily won the second debate, according to most polls, and ended up surging from around three percent in early September to 15 after the debate was over. Even more concerning was the way she wouldn’t admit that she’d been caught in a misstatement. Instead, her PAC released its own would-be Planned Parenthood video. Then she went on Meet the Press and continued to insist she wasn’t wrong. Then, an anti-abortion group called the Center for Bio-Ethical Reform released what it said was the full footage of the CMP video. It still didn’t show what Fiorina described, but it certainly did raise excellent questions about how that footage was obtained and whether the woman depicted in it, who is most likely having a miscarriage, gave her consent for it to be released. 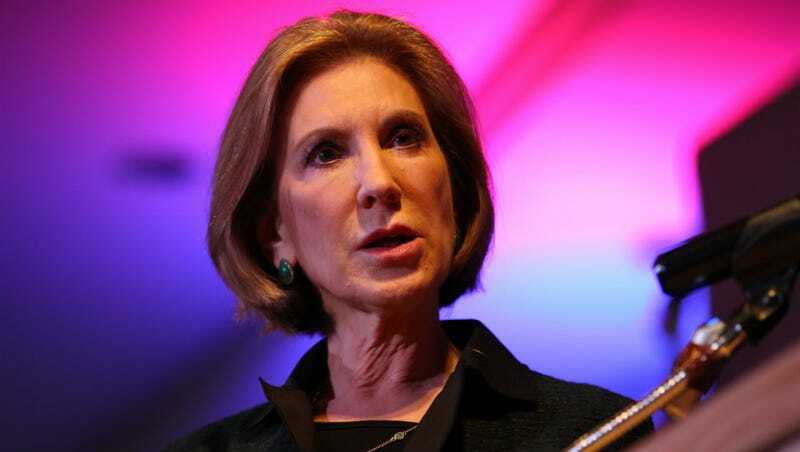 As Mediaite notes, Fiorina’s lead has all but evaporated. She’s at six percent right now, according to a CBS poll, sitting in slumped over crinkled business-suited misery next to Jeb Bush. Anyway, no one tell Carly Fiorina, whose campaign is still sending out fundraising emails insisting she’s winning. This one came in less than an hour ago.